Since 2011, Ireland’s Finest has been rewarding organizations and people who give back to their community in Denver with a free paint job. 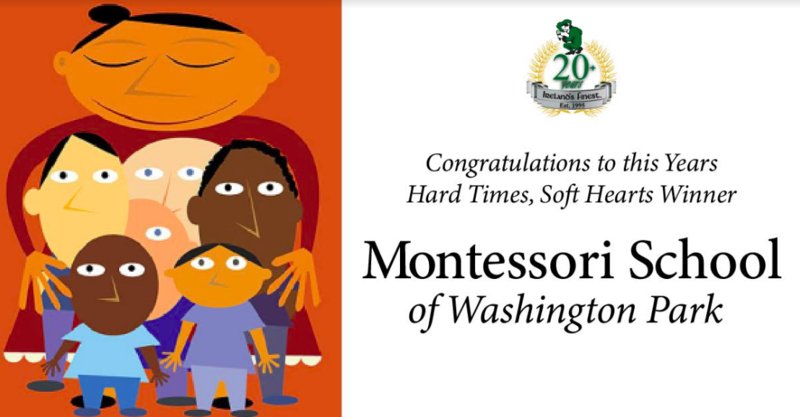 Candidates are nominated by the public through our website, and we received many organizations and individuals worthy of the Hard Times, Soft Hearts prize in 2018. We had an incredibly difficult job choosing from this wealth of community groups and individuals all striving to make our neighborhoods safer and better places to live. In November of 2018, Ireland Finest painting teams put the finishing touches on the Montessori School of Washington Park (MSWP), updating the look and feel of the building that has housed excellent teaching and prodigious learning over the years, creating an environment that fosters early childhood learning. Montessori Wash Park is dedicated to creating a peaceful and prepared environment for its students while fostering independence, respect, and joy in learning. Montessori teachers and administrators embrace each child’s natural wonder and curiosity, working together to strengthen the mind, body and spirit. Since 1975, MSWP has offered an exceptional experiential learning environment to children aged 15 months to six years. MSWP was founded by parents committed to their children’s early education, a crucial point in any person’s development. MSWP prides itself on combining dedicated teachers, challenging learning programs for children of all abilities and learning styles, and a network of committed parents taking an active role in their children’s early education. MSWP is currently run by Mary Purfield, who joined the school in 2006. Purfield is a Colorado native who earned her English degree from Colorado State University. After earning her degree, Purfield worked in publishing and wine importing for years before she decided she needed a change and a new purpose in her work. Part of a large family, now with 14 nieces and nephews, Purfield couldn’t think of a better way to make an impact than to work in childhood education. She earned her Colorado Director Certification in 2010. MSWP Assistant Director Danielle Porras is a former Early Childhood Education teacher who has experience in the classroom working with students of many age groups over her career. Soon after Porras earned her Colorado Director Certification in 2018, she found MSWP and has thrived in her role. Ireland’s Finest has always been about fostering the beautiful community of Denver that we call home. We make the effort to reach out to our community partners and bridge gaps. The Hard Times, Soft Hearts program was designed to provide more support to the Denver community that has supported us from the times we were a small painting company with only a few painters and meager equipment to a full-fledged community partner improving buildings and lives throughout the city. We’re always looking for new ways to build relationships with the public and customers alike. Do you have a nominee for Hard Times, Soft Hearts? Go to the nomination page on the Ireland’s Finest website and explain why your nominee should get a free paint job.